It orbits a red dwarf just a few light years away. 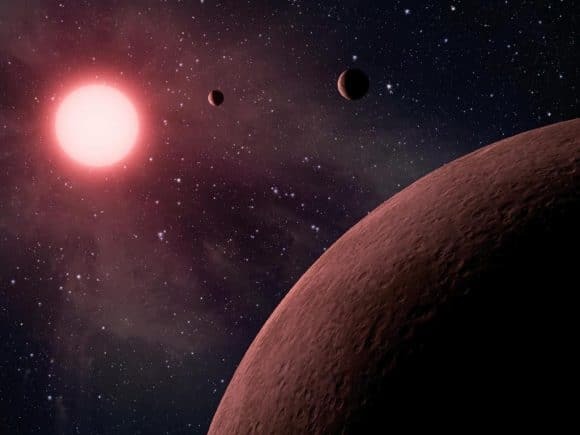 Scientists engaging in exoplanet hunting have recently seen a host of new discoveries. Teams of these celestial sleuths are combing the observable universe looking for a planet that might be capable of hosting life similar to our own. Now, another exoplanet has been discovered, one with several intriguing characteristics. A new study reveals a “super Earth” orbiting GJ 536, a red dwarf star just 32.7 light years (10.03 parsecs) from Earth. The planet’s “super Earth” classification comes from its size— super Earths are planets between one and fifteen times the mass of Earth. This planet is more than five Earth masses. They also found that the planet has an orbital period of less than nine Earth days, and is just 0.06661 AU away from its star. The research studied data from ESO’s High Accuracy Radial velocity Planet Searcher (HARPS) and HARPS-N instruments. It’s not just the detection that is offering new opportunities in exoplanet research. The brightness of the red dwarf and the planet’s closeness to its star makes it an excellent candidate for transmission spectroscopy. That’s where scientists figure out the chemical composition of the atmosphere of the planet based on how the star’s light strikes the atmosphere.